For the children's book, see Hot House Flowers. The group first formed in 1985 when Liam Ó Maonlaí and Fiachna Ó Braonáin, who had known each other as children in an Irish-speaking school, Coláiste Eoin in Booterstown, Dublin, began performing as street musicians, also known as buskers, on the streets of Dublin as "The Incomparable Benzini Brothers". They were soon joined by Peter O'Toole and had won a street-entertainer award within a year. They renamed the group "Hothouse Flowers" (the name was suggested by singer Maria Doyle Kennedy during a brain-storming by band-members and friends in the Trinity College Arts Block café) and began writing songs and performing throughout Ireland. Rolling Stone magazine called them "the best-unsigned band in Europe". In 1986, Bono from the band U2 saw the Flowers performing on television and offered his support. They released their first single, "Love Don't Work This Way", on U2's Mother Records label, which quickly led to a deal with the PolyGram subsidiary London Records. Their first album, People, was released in May 1988 and was the most successful debut album in Irish history. It reached the #1 slot in Ireland within a week and eventually reached No. 2 in the UK Albums Chart. The first single off the album "Feet on the Ground" shot to the No. 1 slot in Ireland on 19 March 1988. The international success of the album received a boost when a music video for the first single, "Don't Go", was played in the interval between contestants and the scoring in the 1988 Eurovision Song Contest. This propelled the song to No. 11 in the UK Singles Chart, the highest position the band would ever achieve in this chart. In September 1988, the band appeared on the bill at the Reading Festival. In June 1989 they played at the Glastonbury Festival, and appeared there again the following year. The group's second album, Home was released in June 1990. It was recorded sporadically during extensive touring; with sessions in Dublin, London, a rented house with a mobile recording set-up in Carlow, Ireland, and one day of work with Daniel Lanois in New Orleans, while Bob Dylan was taking a break from his sessions with Lanois. The album did not have the overwhelming success of the first record, but it did reach No. 1 in Australia in 1991. "Give It Up" and "I Can See Clearly Now" (a cover version of the Johnny Nash song) from the album reached No. 30 and 23 respectively in the UK Singles Chart. In 1989, the Flowers collaborated with the Indigo Girls on their song "Closer To Fine", which became a US hit, and led to some exposure in the United States for the group (albeit limited, as their contribution to the song was uncredited). In January 1992, the group appeared (as themselves) in an episode of the popular BBC drama series Lovejoy, entitled No Strings. In 1992, Hothouse Flowers joined Def Leppard – the combined group going by the name The Acoustic Hippies From Hell – to record three songs ("From the Inside", a cover of the Rolling Stones' "You Can't Always Get What You Want", and a cover of Jimi Hendrix's "Little Wing") that were included as B-sides on Def Leppard's single "Have You Ever Needed Someone So Bad", from their album Adrenalize. Songs From the Rain was released in March 1993. Though it received good reviews and achieved some chart success in Australia and Ireland, worldwide sales were disappointing. In an attempt to boost record sales (and especially to break into the United States charts), the record label and the band's management kept the group on the road almost continuously for the entire year. The band also participated in the Another Roadside Attraction tour in Canada that year, and collaborated with The Tragically Hip, Crash Vegas, Midnight Oil and Daniel Lanois on the one-off single "Land" to protest forest clearcutting in British Columbia. By early 1994, Ó Maonlaí had decided that the group was suffering from physical, mental and creative exhaustion, and he called for a year-long sabbatical. The year-long break turned into several years, as the band members recouped their energy and experienced changes in their personal lives, including divorces, marriages, the birth of children and the death of Ó Maonlaí's father. The group also split from their long-time manager, and Leo Barnes (saxophone) and Jerry Fehily (drum kit) left the group. O'Toole and ó Braonáin spent some of their time off from the Hothouse Flowers recording and touring with Michelle Shocked. Ó Maonlaí worked with Tim Finn and Andy White, while also studying traditional Irish music. In May 1998 they released Born. Joined by Wayne Sheehy on drums and Rob Malone on bass guitar, this album contained extensive songwriting contributions from O'Toole, who (freed from his bass responsibilities) played mostly guitar, bouzouki and keyboards on the recording. The music also incorporated more elements of electronic loops, synthesizers and studio effects. The following month, they appeared at the 1998 Glastonbury Festival. By 1999 they had reached the end of their contract with London Records, and both the label and the band decided not to renew. The label head allowed the group the rights to record songs from their past London releases and produce a live record. Live was self-released by the group later that year, taken mostly from an October 1998 show in the National Stadium, Dublin, with one track from a November show in Tokyo. Sheehy and Malone left the group shortly after the release of the record. Dave Clarke, formerly of Blue in Heaven, joined on drums and O'Toole returned to the bass. In 2000 London Records released a compilation album of songs from their four previous albums titled Hothouse Flowers: The Best Of – 2000. During the band's official hiatus between Songs From the Rain and Born, band members had both written songs individually, and sporadically got together to write collaboratively. Some of these songs were never released, while others altered significantly to become some of the tracks on Born. In 2003 the Flowers collected these unreleased recordings and issued them as Vaults: Volume 1. In February 2004 the band released their latest album, Into Your Heart, produced by the band and John Reynolds. The first single, "Your Love Goes On", reached #3 on the Irish charts. The album also reached #3 on the Irish Album Chart. The record was released on the RubyMusic label in Europe and distributed by Redeye in the United States. They have toured extensively in support of the record, including a performance at the Glastonbury Festival in 2004. Peter O'Toole left the band after this. Ó Maonlaí has done several tours as a solo acoustic performer and released an album in 2005 called Rian. In 2007, Ó Braonáin appeared on Belinda Carlisle's album, Voila, singing a duet with her on a cover of "Bonnie and Clyde". Hothouse Flowers appeared at the Glastonbury Festival Acoustic tent in 2007. Ó Braonáin and Clarke have also collaborated with a former member of The Pogues in the group Pre-Nup, who have opened some shows in America for Hothouse Flowers. An album by Pre-Nup, Hell to Pay, was released on 4 September 2007. In late 2008, Ó Maonlaí released his follow up album to Rian, entitled To Be Touched. O'Toole has rejoined the band and is currently touring again with them after his long sabbatical. Hothouse Flowers toured the UK in October and November 2015, with the tour named "Away with the Traveling Circus". During an interview on "The Imelda May Show" in Ireland, the band confirmed they are working on a new album, tentatively scheduled for release in early 2016. Some material from the forthcoming album was played during the tour. The band played a live version of their cover "I Can See Clearly Now" on the premiere episode of Amazon Prime's The Grand Tour first made available to stream in November 2016. As a result they saw an upswing in popularity, with "I Can See Clearly Now" going to No1 on the iTunes Rock Chart Singles in the UK. On 17 November 2016 the band released a new Studio Album Lets Do This Thing recorded at Windmill Lane Studios in Dublin. ^ a b c d e f g h Strong, Martin C. (2000). The Great Rock Discography (5th ed.). Edinburgh: Mojo Books. p. 460. ISBN 1-84195-017-3. ^ Roberts, David (2006). British Hit Singles & Albums (19th ed.). London: Guinness World Records Limited. p. 260. ISBN 1-904994-10-5. ^ Tobler, John (1992). NME Rock 'N' Roll Years (1st ed.). London: Reed International Books Ltd. p. 448. CN 5585. ^ Tobler, John (1992). NME Rock 'N' Roll Years (1st ed.). London: Reed International Books Ltd. p. 457. CN 5585. Top 50 peaks: "australian-charts.com > Discography Hothouse Flowers". Hung Medien. Retrieved 4 November 2015. Top 100 peaks from January 1990 to December 2010: Ryan, Gavin (2011). Australia's Music Charts 1988–2010 (pdf ed.). Mt. Martha, VIC, Australia: Moonlight Publishing. p. 132. "Easier in the Morning": "Response from ARIA re: chart inquiry, received 19 September 2017". Imgur.com. Retrieved 19 September 2017. ^ "The Grand Tour Episode One Tweaked BBC Noses And Other Five Talk". Daily Telegraph. ^ "Flowers are hot property with 1990 hit". Independent. ^ a b "irish-charts.com > Discography Hothouse Flowers". Hung Medien. Retrieved 25 June 2016. ^ a b "austriancharts.at > Hothouse Flowers in der Österreichischen Hitparade" (in German). Hung Medien. Retrieved 14 December 2016. People: "Hothouse Flowers – People (album)" (in German). GfK Entertainment. Retrieved 14 December 2016. Home: "Hothouse Flowers – Home (album)" (in German). GfK Entertainment. Retrieved 14 December 2016. Songs from the Rain: "Hothouse Flowers – Songs from the Rain (album)" (in German). GfK Entertainment. Retrieved 14 December 2016. ^ a b "dutchcharts.nl > Hothouse Flowers in Dutch Charts" (in Dutch). Hung Medien. Retrieved 14 December 2016. ^ a b "charts.org.nz > Hothouse Flowers in New Zealand Charts". Hung Medien. Retrieved 14 December 2016. ^ a b "swedishcharts.com > Hothouse Flowers in Swedish Charts". Hung Medien. Retrieved 14 December 2016. ^ "hitparade.ch > Hothouse Flowers in der Schweizer Hitparade" (in German). Hung Medien. Retrieved 14 December 2016. ^ a b "Official Charts > Hothouse Flowers". The Official UK Charts Company. Retrieved 25 June 2016. ^ "Billboard > Hothouse Flowers > Chart History > Billboard 200". Billboard. Retrieved 6 December 2018. ^ "New Zealand Chart Certification". Recorded Music NZ. Retrieved 25 June 2016. 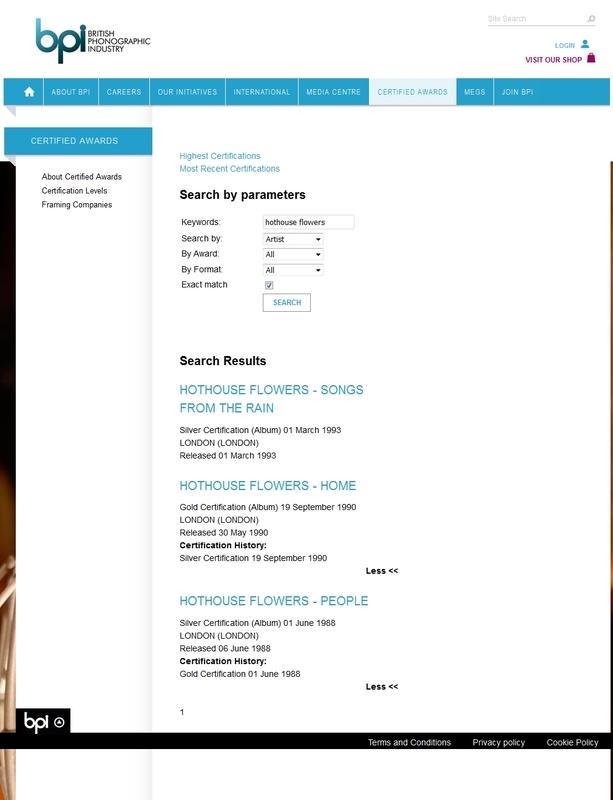 ^ a b c "BPI > Certified Awards > Search results for 'Hothouse Flowers' (from bpi.co.uk)". Imgur.com (original source published by British Phonographic Industry). Retrieved 14 December 2016. ^ Ryan, Gavin (2011). Australia's Music Charts 1988–2010 (pdf ed.). Mt. Martha, VIC, Australia: Moonlight Publishing. p. 132. ^ "Anche Se Il CD Non Esiste Ne Varrebbe Comunque La Pena: I "Fiori Di Serra" Sono Rifioriti! Hothouse Flowers – Let's Do This Thing". Discoclub (blog). ^ "Hothouse Flowers – Just a Note". discogs.com. Retrieved 14 December 2016. ^ "The Irish Charts – All there is to know > Search results for 'Hothouse Flowers'". Fireball Media. Retrieved 14 December 2016. ^ "Ultratop > Hothouse Flowers in Ultratop Vlaanderen" (in Dutch). Hung Medien. Retrieved 14 December 2016. "Don't Go": "Hothouse Flowers – Don't Go (single)" (in German). GfK Entertainment. Retrieved 14 December 2016. "Give It Up": "Hothouse Flowers – Give It Up (single)" (in German). GfK Entertainment. Retrieved 14 December 2016. "One Tongue": "Hothouse Flowers – One Tongue (single)" (in German). GfK Entertainment. Retrieved 14 December 2016. ^ "Billboard > Hothouse Flowers > Chart History > Mainstream Rock Songs". Billboard. Retrieved 6 December 2018. ^ "Billboard > Hothouse Flowers > Chart History > Alternative Songs". Billboard. Retrieved 6 December 2018.